This Photo Shows the First Steps - Preparing the Beads and Wire. Photo © 2009 Amy Solovay, Licensed to About.com, Inc. Learn an easy beaded crochet technique using this free tutorial. You can use the technique to make a single row of crocheted beadwork. I'm sure you will be able to think of other creative ways to use this technique as well. If you need some inspiration, this tutorial includes examples and project ideas. The advantage to using wire: If you're making a motif, wire enables you to shape your motif easily when you are finished making it. The disadvantage: Your item will probably not be machine washable, depending on its construction and the wire you use. You may need to dry clean it or spot clean it. If you're making a necklace, you might want to try this with thread instead of wire. Don't detach the spool of wire yet. If you want a temporary stopper, you can attach a paper clip or safety pin. Alternatively, you can form a loop in the wire and twist it around on itself a few times. Begin Crocheting. Photo © 2009 M. Solovay, Used With Permission. Crocheting the First Few Stitches. Photos © 2009 M. Solovay, Used With Permission. Chain 2 (Views F and G.) The first chain will count as your first single crochet stitch. The second chain is going to go overtop of the bead to accent it and hold it in place. Note that this number of chains is not set in stone, and you can adjust it if you want to. The number of chains will depend on the beads and thread you are using. If you're using large beads and fine thread, you might need a few more chains. Feel free to experiment. Slide the first bead so that it is right next to your chain stitches. Work a single crochet stitch in between the first bead and the second bead. You're probably used to making a stitch in either another stitch or a space. Since there are no stitches or spaces to work into, this might seem like a bit of a mystery, but it's actually pretty simple. Just reach underneath the wire with your hook, and grab the yarn. Bring it back underneath the wire, the same way you would work into a space, and complete your stitch as usual. View I shows the completed single crochet stitch. In this sample, I've only worked one single crochet stitch in between each bead. You can increase the number of single crochet stitches between beads if you want to. For that matter, you could work other stitches in between the beads if you want to. Incorporating the Crochet Work Into the String of Beads. Photos © 2009 M. Solovay, Used With Permission. View K shows my hook pointing to the spot to work the next single crochet stitch. Ending the Top of the Row, and Flipping the Work Over. Photos © 2009 M. Solovay, Used With Permission. Crocheting the Other Side. Photos © 2009 M. Solovay, Used With Permission. Work another 1-2 chain stitches. (View Q.) When you work the next chain stitch, you may want to secure it to the wire. Do this by placing the wire in between your last stitch and the thread; then draw the thread through to form the chain stitch. View R shows my crochet hook pointing to the spot where you will work the next single crochet stitch. Ending. Upper Photo: © 2009 M. Solovay, Used With Permission. Lower Photo: © 2009 Amy Solovay. Continue working a chain stitch over each bead, and a single crochet stitch in between each bead, all the way across until the end of the row. End the row with a single crochet stitch. If your beads have holes that are large enough to accommodate the twisted wire, this part is easy. 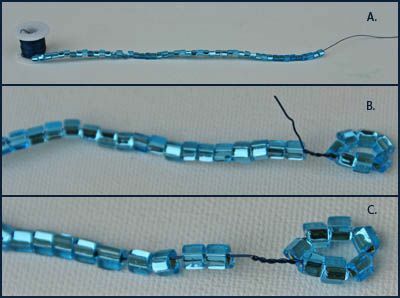 Just slide the entire row of beadwork over the twisted wire, as close to the stopper as you can get it. If there is still a large amount of wire showing, you can work another stitch or two overtop of it to cover it up. Alternately, you could un-twist the wire, slide the beads closer to the crocheted beadwork, and then re-twist the wire. You could also wrap the yarn around the exposed wire a few times before you cut the yarn and weave in the loose ends. If you attached a temporary stopper, you can remove it now. What About the Other End? If you're making a piece of jewelry, add the other clasp, jump ring or closure you need. If you're making a snowflake or similar project, create another beaded loop as shown in views B and C earlier in the tutorial. If you're making a motif that is a closed shape, such as a heart or circle, you can join the ends of the beadwork together. One method of doing this: twist the ends of the wire together. Crochet another stitch or a few more stitches over top of it; alternately, you can twist your yarn or thread overtop of the join to hide it. Then cut the yarn and weave in the ends. Beaded Crochet Examples. Photo © 2009 Amy Solovay, Licensed to About.com, Inc.
Upper Left Photo: Small pink and red mixed beads paired with red embroidery floss. I used a size 6 / 1.80 mm steel crochet hook to make this sample. Middle Photo: This sample features the same supplies used above, plus additional green beads and green embroidery floss.The green beads are significantly larger than the red and pink beads are. Don't be afraid to try some out-of-the-box combinations! I used this sample to create an apple applique; you'll see a photo of it on the next page of the tutorial. Lower Photo: Large pale green faceted beads paired with acetate ribbon yarn. I used a size d / 3-3.25 mm crochet hook to get this look. Project Ideas for Using This Technique: Beaded Snowflakes, Beaded Apple Applique, and Tunisian Crochet Purse With Apple Applique Applied. Photo © 2009 Amy Solovay, Licensed to About.com, Inc.
Alternate red and white beads for a Christmas candy cane. Make beaded flowers using this technique plus a flower loom or daisy loom. Make other beaded motifs: hearts, pumpkins, spirals. Make letters or numbers to spell out names, dates, etc. Make beaded jewelry: bracelets, chokers and necklaces. This Photo Shows an Example of What Not to Do. See How the Chenille Yarn Overwhelms the Bead and Obscures It? This Is Not an Ideal Combination; Either Choose Larger Beads to Go With the Chenille, or a Finer Yarn to Go With the Beads. Photo © 2009 Amy Solovay, Licensed to About.com, Inc.
Study the photo above for an example of what not to do. See how the yarn overwhelms the beads? I thought this chenille would be a delightful yarn to use for beaded snowflakes- and it would be, but the beads I chose are not ideal. They are too small. I will try again with some larger beads. If you decide to use small seed beads, you're going to need a very fine thread, and a tiny steel crochet hook. You'll probably want to consider using a magnifier too. If you want to use worsted weight yarn, ​choose some BIG huge beads to match. Feel free to be creative and experiment with color combinations. I didn't get too crazy with colors in this tutorial; I stuck with safe colors - teal beads with aqua thread, red beads with red thread, green beads with green thread, etc. If you don't have a lot of color confidence, these tonal color combinations are pretty safe; there's no need to worry that the colors will clash or look weird together if you match them closely in this way. Remember that you can also create interesting combinations using dramatic contrasts between the beads and the thread.